Today starts another challenge at Creative Card Crew! The theme of this challenge is Anything Goes! So you are free to create whatever you want! You can check out his images here! This image was so fun to color and design around. His images are so much fun to work with because they have attitude! Don't you think? This image makes your card hip enough to give to any you man in your life. 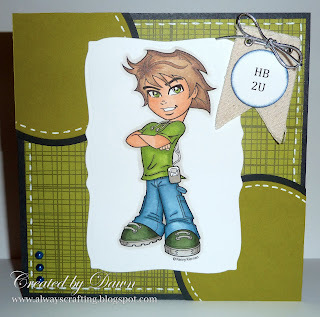 Go on over to www.creativecardcrew.blogspot.com and enter your card today! Great guy card and beautiful colouring. I love the green, must make more use of green myself. Great colouring, the faux stitching really makes the background stand out. Fab card, I agree they do have fab attitude! Very cool card! Thanks for joining us this week at My Craft Spot! Neat card...love the way you did the background ! Thanks for playing along with us this week, at My Craft Spot ! Great colour combo, great card fora boy. Thanks for joining the challenge at My Craft Spot. Love the attitude on this card :) Great job, love everything about this card. Thanks for joining us at Stamps R Us. Great card!! I love your coloring. Thanks for joining us at My Craft Spot. Great card! It's perfect for a teen boy. Your colouring is fantastic!